Passover is, perhaps, the most “visible” Jewish holiday for me. After all, we have featured the Matzoh Man in many photos and short video clips here on CatSynth, and now twice in a row for CatSynth TV. For this year’s episode, we took audio output from our mechanical friend via a contact mic and sent it into the KOMA Field Kit. We then split the signal into audio, which was run through our modular synthesizer – specifically, the Rossum Electro-music Morpheus – and the Field Kit’s own envelope follow and actuator section, ultimately driving the solenoid. It was a fun little demo both to make and to watch. Matzoh Man joins the synthesizers in a ritual of devotion and irreverence. I also included a little demo of the ritual diet, with matzoh, prepared horseradish, and Kedem grape juice. But beyond that, anything is fair game for me during Passover as long as there are no piggies or shellfish, or leavened bread. No beer allowed, but non-kosher wine and spirits are fine. It becomes a bit of a game to see if for eight days I can follow these simple rules. To someone more Orthodox, or even the least bit devout, this simple approach could be transgressive, or even blasphemous. But from my point of view, not only is it plenty but I also sometimes wonder why I both at all. It’s not like I believe in the literal truth of the Biblical story, or have any fear of or respect for any religious authorities. Somehow, though, I still feel compelled to participate. And not just participate, flaunt it, reminding friends that I can’t share pastries or bread products over the week because I’m Jewish. That feels important to remind people of. And it sometimes makes its way into my music, through titles like Kislev and Donershtik (Yiddish for Thursday) or organizing structures in stories. It’s fun. It’s “cool”. But also it feels more urgent, as the world around us seems more anti-Semitic now than it did during my youth. I’m deeply bothered by the attacks that seem to be increasing against Jews, both verbal and violent. But I’m also concerned with an increasing religiosity and sense of obedience among many who identify as Jewish. If being Jewish is just about being religious, or being obedient to a text or patriarchal authorities, then it does truly become time to ask “why bother?”. But for now, we do our best to both persevere and enjoy. 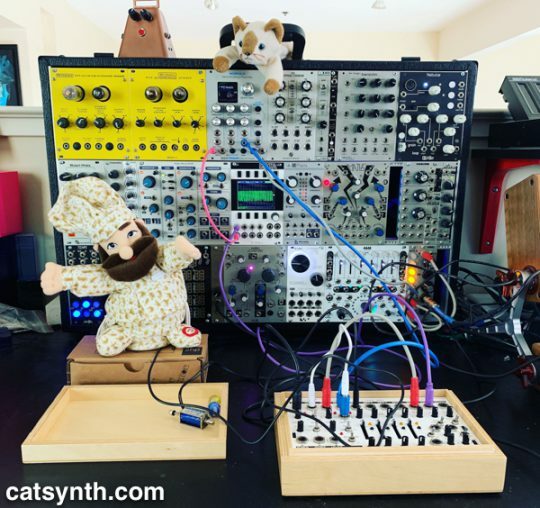 The Matzoh Man returns for Passover on CatSynth TV, this time accompanied by a Minimoog, Roland VP-03 vocoder and our trusty Nord Stage EX. The Dayenu song is a tradition on Passover. The word dayenu approximately translates to “it would have been sufficient” and is used as a phrase of gratitude for each of the miracles recounted in the Passover Hagaddah. Matzoh Man Returns for Passover 2017! As dusk approaches and we at CatSynth prepare for the start of Passover, we present the Matzoh Man, now in full HD video! For those who are not familiar with the tune, it is a version of Dayenu, which is song at many seders, including ours growing up. You can find out more here.